If you are like me who find it difficult these days to do without internet, you will be looking for the best (high-speed) internet access at affordable price. I am among the masses that are not fortunate enough to live in an environment where the interests of many commercial activities are focused, that doesn’t mean I live in a remote area. A little research reveals a lot of things to me. Correlating with my statements above no any 4G services provider ever cover my community. Among the GSM operator who claimed operating 4G internet services only Etisalat can prove that but the price is cut-throat. Recently, I was reading on techpoint about the call by Alliance for Affordable Internet (A4AI) for the global target for affordable internet access. In 2016, A4AI called on countries to endorse the sale of 1GB at not more than 2% of monthly income also known as “1 for 2”. Funny enough, Nigeria is the first African country to endorse the call but not among the 5 country that has implement it till date. The A4AI is a union of institutes from diverse sectors all over the world, working to cut down broadband prices and make affordable internet access a reality. According to a report released by Alliance for Affordable Internet (A4AI), only five African countries have ‘affordable internet’. The five countries are Mauritius, Morocco, Tunisia, Egypt, and Sudan. In other word if Nigeria will be on this list, 1GB internet access should cost N360, 2% of the Nigeria minimum wage of N18,000. In Nigeria today, the average internet data plan is going for N1000 which is about 6% of our minimum wage. The most ridiculous part of the report was that the five African countries that now have affordable internet are yet to endorse the A4AI’s 1 for 2 target. Meanwhile, Nigeria, which was the first country to endorse the target is yet to make plans towards implementation. Words and signatures are not enough to implement this policy. In term of speed, Nigeria internet was outrageously slow scoring us 82nd position among the 87 rated countries. This means consumers are paying higher than what they are receiving as many time and other resources are wasted trying to access internet. I remember the early day of GSM in Nigeria, when Econet Wireless and MTN was just the operator. There is conspiracy between them in every aspect of the game. 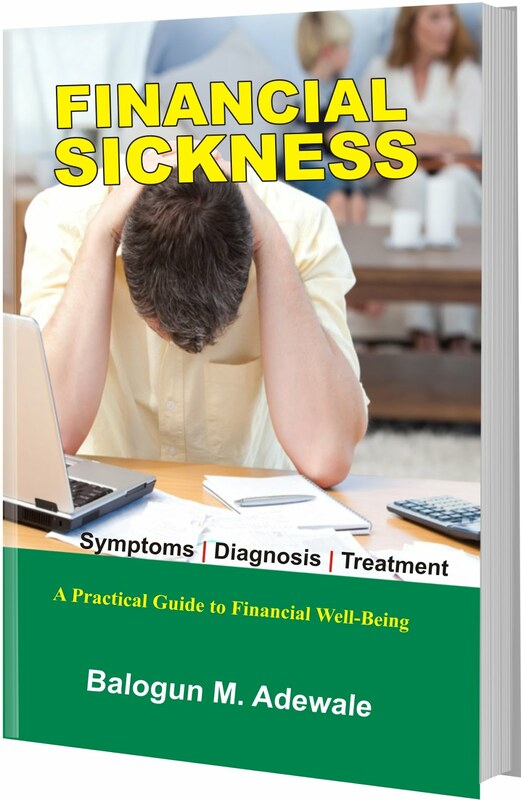 The SIM card that is free today is going for an average of N50,000 couple with high call rate and the big part of it is that, a second call was charged at I minutes rate claiming there is no way they could charged per second. This conspiracy lasted for 2 years until Globacom commence operation forcing the two existing operators to reduce the cost of SIM acquisition, reduce tariff and the ever impossible per second billing was made possible. I am seeing the same scenario here with Express Wi-Fi. With a wider coverage, other internet service provider will be forced to adjust their tariff to the 2% of minimum wage as suggested by Alliance for Affordable Internet (A4AI). 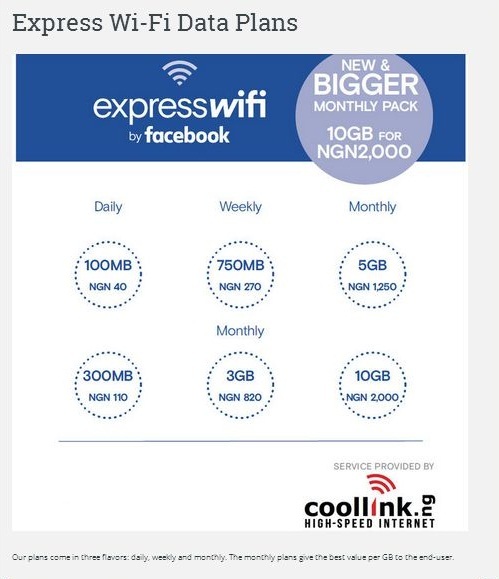 Coollink, an internet service provider in partnership with Facebook is launching Express Wi-Fi across different locations in Nigeria, bringing affordable, high-speed internet to your neighborhoods. As copied on the Coollink website, Express Wi-Fi is a cheaper way to get onto the internet than mobile data packs (2G/3G/4G). Express Wi-Fi customers will be able to purchase fast, affordable data packs to access the internet via local hotspots (Wi-Fi Fast Internet Zone). You can use the internet to get information on things like news, weather, sports, and stay connected with your friends and family by chatting and sharing pictures. You can also download music, watch videos, play games, and more. 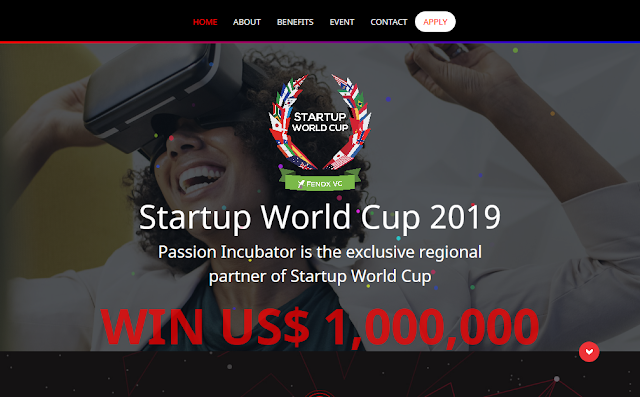 Express W-Fi has done what is expected of internet service provider to meet up with the cost of 1GB internet tariff at 2% of minimum wage as demanded and endorsed by many African countries. With the tariff table below, you will agreed with me that they surpass the expectation. In addition to the affordable broadband internet, facebook is also making it possible to have access to some partnering website with free data. All you need is to activate your internet connection even if there is no data there it will still connect. You have the opportunity to use their service for 14 days with each day given you to access data worth 100mb.